If you looked at the UIL redistricting site to see which teams were in district 24-5A and then paid attention to the season those girls and boys teams were having then you knew it would take a Hurculean effort to qualify from the district meet to the area meet. That is exactly what it took and then the marks put up by some of the top placers were outstanding! 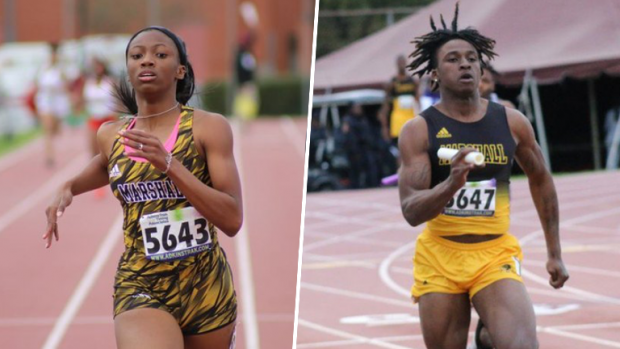 Many wondered how Fort Bend Marshall could skip the Texas Relays with the season they were having on both the girls and boys sides. Well, if the results are any indicator that they were perfecting their craft and as to the where those two programs are currently at, then watch out for the remainder of the season. The Marshall girls won the 4x100 relay with a 46.86, was second in the 4x200 relay with a 1:41.06, and then they added the 4x400 relay victory with a 3:48.84. They also got outstanding performances from their young 400m runners Cesley Williams and Jailynn Smith. Williams, just a freshman dropped a gem of a race with a 55.30 and Smith who is a junior went 55.75 for a 1-2 district meet finish. The time was a .05 PR for Williams who went 55.35 a few weeks ago at the Spartan Relays. However, this week's time is the second fastest time for Smith who went 55.70 two weeks ago at the Victor Lopez Classic. On the boys side, it was more of what we saw with the girls, and that was some big individual performances and some HUGE relay performances! Junior and five star football player Devon Achane is used to providing oohs and aahs when he runs. The blue chip running back dazzles crowds every Friday night in the Fall. However, last night, he did his work on the track as he sprinted to the UIL 5A - District 24 200m victory and he did it in spectacular fashion by dropping a US #5 - 20.91. Achane was also key to three exciting relay races for the Buffalos including the 4x100 and 4x200 relays. He connected with his teammates to run 40.15 in the 4x100 and 1:23.99 in the 4x200. Those marks just improve their already US #1 marks on the 2019 season, but they also move the Buffalos up to tied for #14 in the 4x100 relay and moves them to #8 All-Time in the 4x200 standings, pushing back the mark of 1:24.01, which was held by the 2015 Fort Bend Marshall team. Both Manvel girls and boys won the District 24-5A team championships.